In the latest release we have introduced enhanced documentation of OpenFOAM within the HTML source documentation generated using Doxygen. The new feature uses extended file headers in which documentation is written and processed into pages by Doxygen. Doxygen modules provide a convenient interface to grouped information, accessible via the Modules tab located in the main header. Currently, grouped information is available for boundary conditions, function objects and turbulence models. Each group item is a link to the contents of the respective groups. The helper utility, foamHelp, allows the user to bring up documentation from a terminal prompt. The usage is shown below. 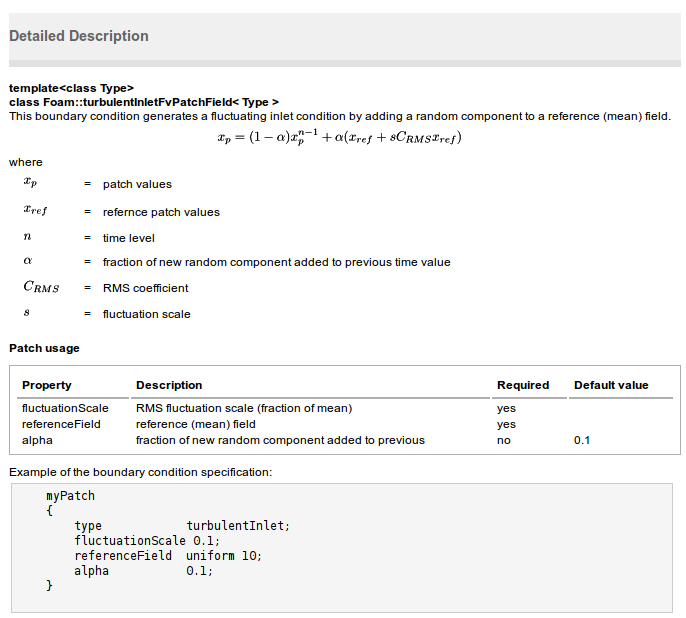 A high-level view of boundary condition help can also be accessed from the main Doxgen page, from the Using the code section. - list all boundary conditions for a given field, e.g. foamHelp also brings up documentation for function objects, with usage shown below. A high-level view of function object help can also be accessed from the main Doxgen page, from the Using the code section.